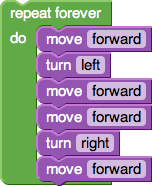 This entry was posted in challenges, programming and tagged Blockly, Google, graphical, maze, programming. Bookmark the permalink. This solution implements a “left-hand rule.” That is, any time you can turn left, do so, otherwise just follow the path. This has the advantage of being more general, in that any maze without loops can be solved by the algorithm. On the other hand, it is slower, and, as noted above, loops can cause problems. I did it with six instructions. Fun! 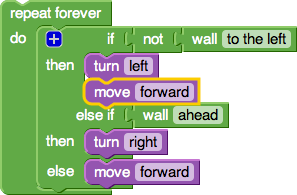 I really like Blockly and am looking forward to extending it slightly, and maybe eventually finding a way for code that people create to be saved and shared (rather than having to take a screen-shot!). Oi! The LOGO-esque setup is great. Unfortunately, I cannot reproduce my maze solver in your environment, as it lacks a an “If…Then…Else” structure. The first link isn’t to something I created, I found it through the Blockly Google group. I have plans to extend the Drawing environment but I have put it on hiatus for now as I have more important things to complete. There is a similar webbased graphical programming tool called Visogram (http://www.visogram.com) that might be interesting for you. In contrast to Blockly it is dataflow-oriented – you connect inputs and outputs of modules. Additionally you can create user interfaces to visualize things easily. Those interfaces are purely based on web standards and run on any devices that comes with a web browser.